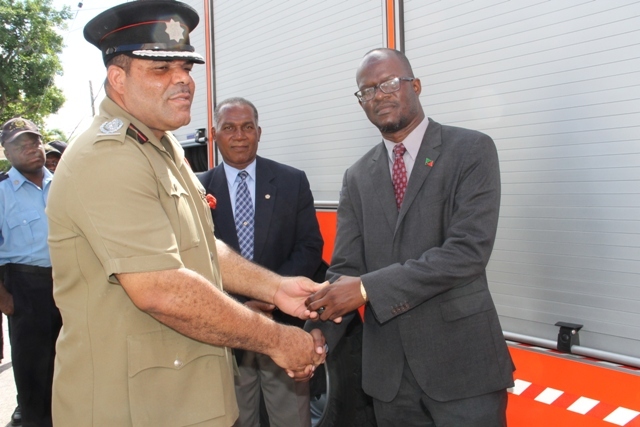 NIA CHARLESTOWN NEVIS (December 18, 2014) —Acting Chief Fire Officer in St. Kitts and Nevis Everette O’Garro, described a new state-of-the-art fire tender handed over to the St. Kitts-Nevis Fire and Rescue Services Nevis Division would boost the operational capabilities offered there. 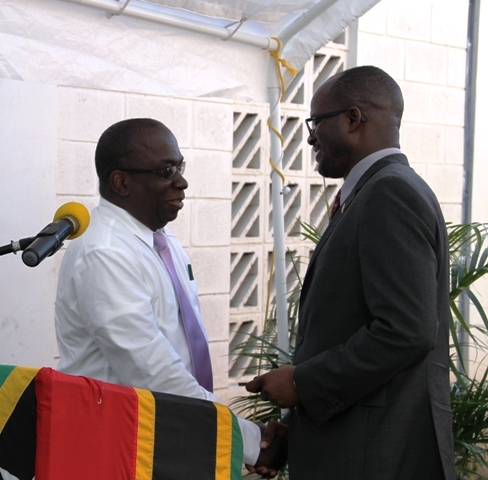 The Fire Chief made the comment when he delivered remarks at the handing over ceremony at the Fire Services Complex in Charlestown on December 17, 2014. The new fire truck was procured with funds from the 10th European Development Fund (EDF) and the Federal Government at a cost 0f US$300,000. 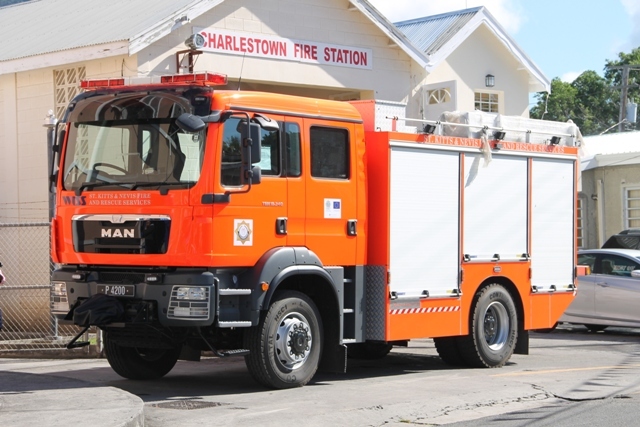 “The commissioning of this new fire tender will no doubt bring with it tremendous improvement in the response and overall operational capabilities of the St. Kitts-Nevis Fire and rescue Services Nevis Division,” he said. Fire Chief O’Garro gave the assurance that the new equipment would help to keep Nevis safe. “I can safely say without a doubt, that the fire protection capabilities in the Nevis Division will be greatly improved with the acquisition of this truck and that this places us in a much better position to fulfil our mission of the St. Kitts-Nevis Fire and Rescue Services, which is to make St. Kitts and Nevis a much safer place for one and all,” he said. According to the Fire Chief, the new fire tender was equipped with the latest fire suppression equipment and tools. “It carries a whopping 1,000 gallons of primary extinguishing media. 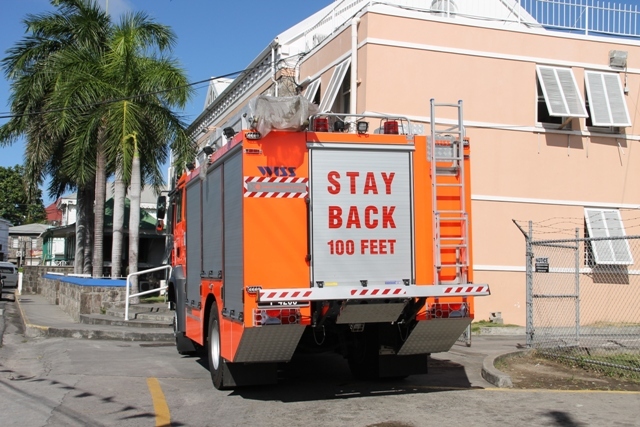 This is a considerable upgrade to our present 400-gallon capability which will greatly assist us when operating in areas where there is no access to fire hydrants as this is a real problem encountered frequently in some areas of Nevis. “In addition, the truck is equipped with aqueous film foaming foam (AFFF) which will serve as a secondary extinguishing media.” He said. Mr.O’Garro noted, that the new addition to the Nevis Division’s fire fighting capabilities should be recognised as a tremendous addition since it provided the added capability of responding to and extinguishing fires which involved hydro carbon fuels. The new fire tender is outfitted with two mechanically-operated first aid hose reels which will be deployed when wild fire operations are undertaken. It has a diesel engine made by Mercedes Benz; operates on low sulphur diesel fuel and meets with the new emissions standards adopted by the European Union. 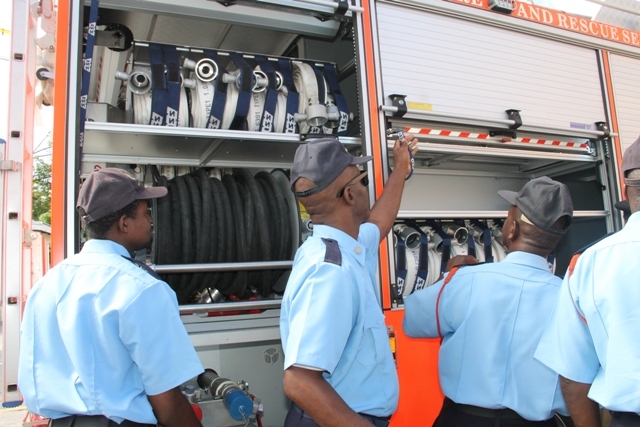 Meantime, Deputy National Authorising Officer (NAO) Calvin Edwards in brief remarks said the handing over of the new fire tender marked the achievement of an important milestone in the longstanding partnership between the people of St. Kitts and Nevis and the European Union. He said the event also signalled the commitment of the Government of St. Kitts and Nevis in strengthening the capacity of the security forces, to ensure that they have the necessary skills, abilities, equipment and infrastructure to execute their duties at the highest level. Edwards urged the Officers who would utilise the vehicle to take care of the new tender. “I use the opportunity to encourage all officers of the Fire and Rescue Services to be diligent with their duties which also include the utilisation of the established maintenance routine in order to ensure the longevity of this important asset which is valued in excess of EC$900, 000 in the service of the people of Nevis to ensure that when called upon, their lives and property can be preserved,” he said. The NAO also added that the handing over of the fire tender was only one investment in a comprehensive programme which would continue to deliver vital outcomes that would have a sustainable impact on the transformation and development of the security sector over the medium to long term.